When I dropped my CRX 3" I felt like I was the lowest person in the world, loved it. Need to get my shocks in so I can drop back to 2.5 or so. lowest car i've ever driven was a 944 turbo (not counting a formula 1600 racer - basically a go kart on steroids). and probably nowhere near as low as the cars just mentioned. the last gen metros are higher than the forkeswift generation ones. i'm sure it's exactly for the reason mentioned: to make you feel safer by getting your line of sight above truck bumper level. above: replace all divots! forklift divots anyway. 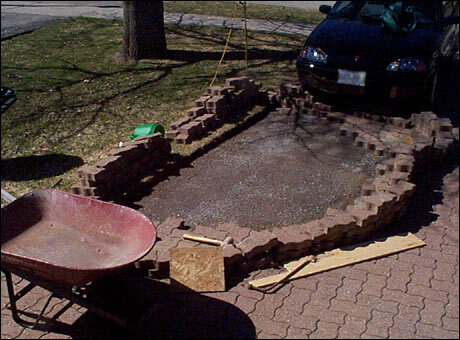 fixed the driveway where the baker sunk in while parked. one fish, two fish, red swift, blue swift. you're looking at $250 worth of suzukiclones sitting on the freshly repaired driveway. 2.3 total liters and 7 cylinders of fury. the woman bought it for $300 three years ago, and sunk $1500 into it since then. it has a brand new gas tank, radiator, catalytic converter, recent tune up. too bad all those parts are coming out. ah well, maybe they'll sell on teamswift.net. will be swapping over the 13 inch rims (blue has 12s), hatchback (rust and broken lock on the blue one), and misc other bits and pieces. i like the look of the swift's aero headlights, but i would need to change the hood and bumper if i want to use them. decided not to bother. someone already asked to buy them anyway. i don't yearn to crash into anything in the red swift! the way it is, it's got the structural rigidity of a wet kleenex box. i brake for flies now when i drive it on my street. did the control arm/ball joint swap today. also pulled the good ignition switch from the red car (man, that was a stupidly complex job.. but i guess that's kind of the point, so you can't steal them easily). the blue car's ignition switch isn't too secure - you could start it with anything approximately key-shaped. to be fair, i think it would be more accurate to say i know "next to nothing" about electric motors. this is an immersion learning experience. if you knew what I know you wouldn't even think of getting started. don't forget our low expectations: 48v; 40 mph (30 would be ok); 10 mile range (hell, 7 would be ok); acceleration best measured with an egg timer; hills to be avoided; shoestring budget (threadbare). basically we will deem this to a grand success when it moves under its own power at above a jogging pace. thanks for the amp test lesson. i'll get to that once we move to the electric portion of the program. 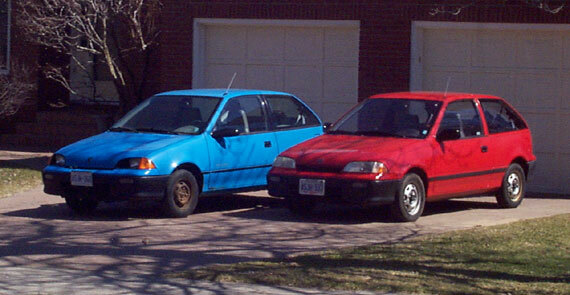 so far this week i've been playing with the blue car: swapped the bad control arm/ball joint with a good one from the red car; swapped the rusty blue hatchback for the less rusty red one (sorry, the remaining pair of struts are weak and not worth sending); swapped rims; misc minor repairs; and... i've waxed a panel each day. as you can see from this pic, it was extremely weathered. now it actually reflects stuff (well, some panels do). 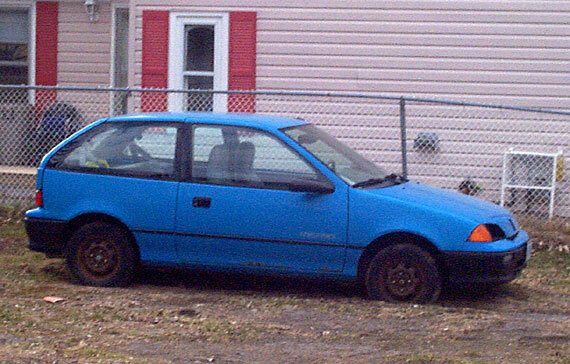 my neighbour has christened the cars "superman cars" since they're now a mix of just the right shades of red & blue. also, i've been pulling parts from the red car that people say they want to buy. i think i might make my money back! this evening's blue metro tasks: fixed the broken driver's side window lift mechanism & outside door handle; drilled & tapped a new bolt hole for the control arm rear attatchment bracket (i twisted the head off one when doing the swap); waxed 2 more panels. just about all that's left to do before submitting the car for inspection is check the rear brakes, splice some neoprene into a seeping gas line & patch 2 small holes in the floor. and swap the blackfly's wheels over (blue car's tires are shot). then it's motorectomy, part II: ICE-out! had the flu this week, so didn't get much done on the forkenswift project (or any project). but... as of today i've sold enough stuff from the red swift that we've made our money back on it. (and there's still a perfectly good motor - with decent compression even - that nobody seems to want.) i think it's reasonable to expect that by the time i'm done parting out the unnecessary stuff from both cars, they will be "free" or pretty close. A lot of stuff can be picked up for cheap and with a bit of effort parted for some reasonable money/parts you want. small town. no craigslist. closest list is for ottawa - 100 km away. but i posted an ad anyway. and while i was writing up the ad, someone contacted me through teamswift looking for the 1.3 for his sidekick. it's the first bite so far, and he signed up on teamswift just to contact me. so maybe that will work out. blue car update: leaky fuel line repaired; leaky exhaust patched. the last thing on the list before taking the car in for inspection is patching up 2 small holes in the floor (but we all know what "very small" turns into when dealing with rust, don't we?). the red car has been sitting, waiting for its motor-ectomy. we may end up doing both cars at once. also, my buddy's father has a bush lot about 25 km from here, and we've decided we're going to hold onto the red car rather than scrap it once we've had our way with it - just in case we end up needing more parts... glass, fenders, whatever. so after the motorectomy, we'll pull it out there and park it. pulled up the carpet, got out the grinder, and transformed the 2 small holes in the blue car's floor into a small future welding project. it's not nearly as bad as the red car's floor though. the blue car is very fixable. despite having not been driven for 6+ months, the carpet underpadding was quite wet when i lifted it. 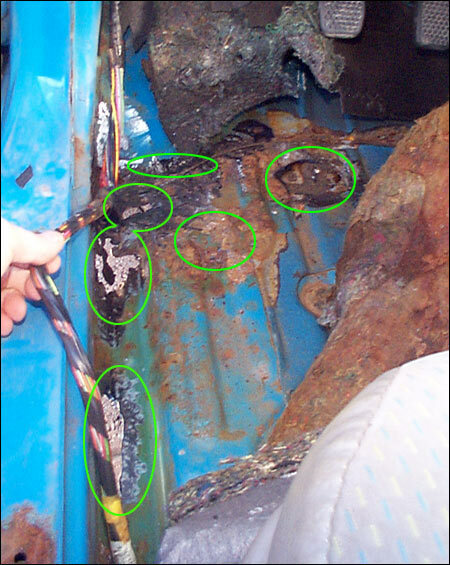 just 1 small hole + always wet underpadding = accelerated & extensive rust.